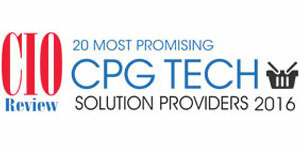 Technology has had touch points along the entire value chain of the CPG industry. Off late, there has been a constant infiltration of newer technologies such, as cloud, data analytics, and mobility, into the vertical, which has revamped the entire operational aspects of the sector. One profound change is that technology, data analytics to most extent and cloud the rest, has changed the very starting point of a product’s lifecycle. Opposed to procurement of raw materials being the previous point, today it is the insights unlocked from big data accumulated at point-of-sale that enables newer targeted product development as well as improvement of existing ones. These insights also drive today’s region/segment specific marketing campaigns. Changes ahead of the value chain are visible in capital goods sourcing, supplier quality management to restructuring manufacturing floors with technologies such as, control system integration, manufacturing execution system, manufacturing information intelligence, and IoT that have significantly raised efficiency standards across different segments. Additionally, environmental concerns gaining steam and streamlining expenditures have injected a booster dose of more powerful, efficient energy management and predictive maintenance solutions. In recent times, the advancements around mobile technology and growing influence of social media have mandated businesses to pursue customer relationship more aggressively and rethink their loyalty building/maintenance initiatives. Apart from better CRM solutions, this has also led to a whole new breed of services that are driven toward expanding a product’s market exposure and mining actionable insights collected from millions of users. Moreover, there has been a spike in demand for solutions and services that can help businesses manage margins by optimizing operational and corporate strategies rather than simply sourcing cheaper raw materials.